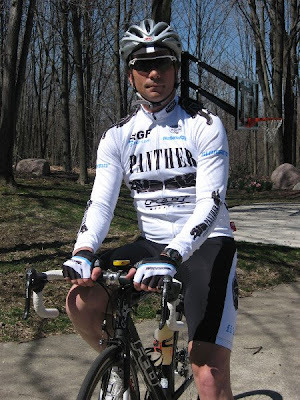 Andy Clarke is the 38-year-old CEO of Panther Expedited Services, Inc., and a regular customer in our Medina store who enjoys bicycle racing and riding with his family. Q. How did you get involved with cycling? What were you riding at the time? A. I originally purchased my first bike (yellow Cannondale R1000) to compete in triathlons. Interestingly enough, I never actually entered one. Didn’t really like to swim and running was too hard on the joints. At the time I started cycling, I weighed about 220 pounds. While I haven’t ridden my Cannondale in years, it still hangs on my garage wall. I’ll never get rid of it. The good news is that I now weigh 180 pounds. Q. What's your favorite thing about cycling? A. Jean Bobet said it best - "The voluptuous pleasure that cycling can give you is delicate, intimate, and ephemeral. It arrives, it takes hold of you, sweeps you up and then leaves you again. It is for you alone. It is a combination of speed and ease, force and grace. It is pure happiness." Q. When did you decide to compete? A. I started doing century rides while living in Tennessee; completed my first one in just over 6 hours in the fall of 2003. 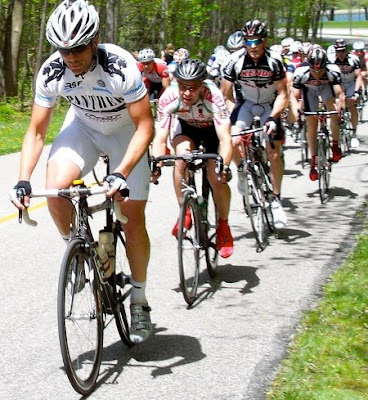 I wore out a trainer over the winter, dropped about 15 pounds and did my second century in the spring of 2004 in 4:45. At that point, I was hooked. I did about 8 century rides in 2004 before deciding to race in 2005. Q. What was your first race? How did you do? A. My first race was a Cat 5 crit in Knoxville, TN and I lapped the field. They immediately upgraded me to a Cat 4. I am now a Cat 1. Q. What races have you won? A. Interesting question, and I don’t know the answer. I would guess I’ve probably won about 20 or so with a lot of top 10 finishes. My racing highlights include: TN Masters Time Trial and Crit in 2006 and the Ohio Elite Time Trial and Crit in 2007. Q. What's your favorite ride? Favorite bike? A. I used to live in rural east Tennessee and there was a 120 mile ride with over 9,000 feet of climbing. The real beauty of the ride was that I could roll out of my garage and not go through a single traffic light and encounter very little traffic. A close second was doing the Tour of Flanders last year the day before the pros. Favorite bike is my Merckx Team SC. A true workhorse. Q. Is it a challenge in Ohio to be able to train enough to be competitive? With a career, and family, and weather in Ohio, how do you schedule your rides and training? A. Good question. When you have little time, you have to make the most of it. So, if I only have an hour to train, I go very hard for that hour. The hardest part for me is the travel I have as part of work. Sometimes I am stuck sitting on a hotel stationary bike. Winters are also hard, but I take weekend trips to warmer weather and sometimes bring a bike. Q. What foods do you prefer for training and competition? A. Foods that digest easily. Pasta and chicken the night before a race. Usually cereal or oatmeal the morning of a race, and depending on the length, I’ll have gels during the race. It is important to recover correctly after a hard training ride or race. PB&J with bananas are one of my favorite recovery foods. Q. How do you prepare mentally for a race? A. I used to get all worked up before races, because I worried about hundreds of variables that I could not control. I am now calmer in my approach by focusing on the few variables that I do control. The most important thing is to make sure that all your gear is ready and works properly the night before an event. The last thing you want to do is be running around 5 minutes before the start of a race looking for a wrench or bike pump. Q. Can you recommend any training resources? A. When I first got into racing, I engaged an online coach to help with training. This resource was a tremendous help, as it allowed me to make breakthroughs in training. I no longer use a coach, but I would still recommend one for those starting out. Q. Do you have any advice for new cyclists? A. Have fun. Whenever I ride, I always tell myself that “I chose to be out here on my bike, nobody made me do it”. As a result, bad weather and bad drivers don’t bother me too much. Also, get a bike and gear that fit you. If you are going to be on a bike and get the most out of it, you need to be comfortable. You guys didn’t ask for a plug, but I will offer one up. Develop a good relationship with the LBS [local bicycle shop] and the mechanics. That means bringing in donuts and coffee every now and again. They will make sure that the bike fits correctly and that you are happy with your ride. Just ask the guys at Century Cycles in Medina – they have definitely taken care of me on many occasions. Q. Tell us about your family; are they supportive of your riding? A. My wife Colleen and I have been married for 14 years and we have 3 children: Kelton (10), Cameron (8), and Riley (6). They are very supportive of my cycling and often come to races. They like it when I win, because they get the money. Q. What races are you planning to compete in this year? A. Big ones are Masters Nationals Road Race, Time Trial, and Criterium. Also the State RR and Crit. Q. If you were a Star Wars character which one would you be? A. Easy – Han Solo. He is one cool dude. This is a photo from a race that Andy rode in recently; he won the lap shown in progress! Thanks, Andy, for sharing your story with us, and we look forward to seeing you around again soon! P.S. It is just a coincidence that Andy shares a name with Andy Clarke, President of the League of American Bicyclists!